Our toy pick in the penultimate day of the 2017 PopCult Gift Guide is Egg Babies, a new toy for young kids that combines the joy of blind-box collectible fun with the cuteness of plush and the sheer enjoyment of breaking stuff. This is a great gift for kids, ages three and up, who like to be surprised. Egg Babies are colorful Styrofoam eggs with a “FUR”-endly surprise inside that’s just waiting to hatch. Kids simply crack the egg open to reveal one of six adorable, soft and cuddly characters, each with a unique personality. The eggs are made of styrofoam and break open easily. In fact, it might be harder to get them out of the package than it is for kids to open the egg. 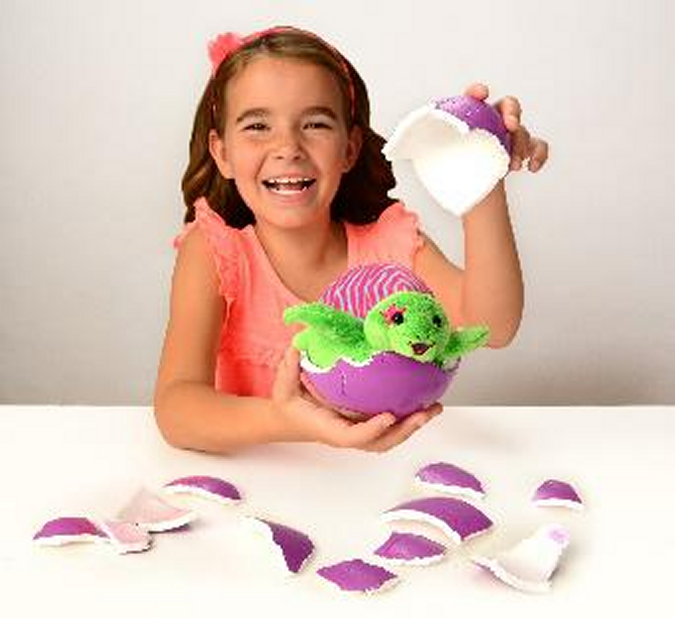 This is just such a fun concept, and kids are sure to fall in love with the idea of “hatching” their new plush friends. Characters include: Turtellini, an out-going and caring turtle who loves to share treats; Patches, an energetic and active pup who’s mastered the art of true sportsmanship; Bubble Gum, a confident little bunny who expresses herself through music; Kiwi, an extrovert and drama chick who loves the spotlight; Snowflake, the sweet and lovable kitty who makes new friends wherever she goes; and Hamlet, a cheeky and mischievous pig who’s known for stirring up a little trouble. You may notice from the package that Snowflake is the “mystery” Egg Baby. Kids can easily crack the Egg Babies open to enjoy the “eggcitement” of what’s inside, and at an affordable price around ten bucks each, young collectors are sure to add more than just one to their holiday wish lists. Each egg measures 6”H x 4.25”W and the plush character is approximately 3.5”W x 4”H. This is a terrific stocking stufffer for the plush-loving kid of almost any age, and it could turn them into a collector, so be prepared and get several. You can find Egg Babies at most toy retailers, or visit Amazon, where they seem to cost a little more, and you’ll want to order quick to make sure you get them in time for Christmas.